We’ve been by it countless times. Every time we zip by it, we grab a fleeting glimpse and wonder aloud to each other what is etched on it, what is it’s significance, and why it is there. Today I finally got to get up very close and snap a photo of the words written on the plaque! 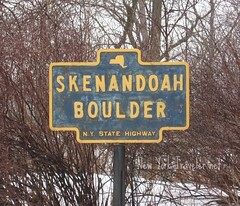 I’m talking about the Skenandoah Boulder, on Route 5 outside of Oneida Castle village limits. There is a stone resting on the side of the road, by a very busy four corners area, with an old historical marker punctured in the lawn next to it. “Skenandoah Boulder” is all the historical marker says. I’d finally stopped a few months ago (in December) to get a photo of it, but the snow had been too high and too slushy for me to read what the plaque says. That photo is all I could get from my quick exploit. The stone was tantalizingly near, but I couldn’t get closer than that! The stone (about the size of a small couch, or loveseat) has an old copper plaque affixed on it (it’s now green). The print is small– too small for any passer-by to read even one word. Stopping the car on the side of this busy road is done at one’s own risk. I’ve always either been in a hurry or haven’t felt brave enough to stop the car and get a closer look. Now that it is spring, I could park my car more safely, meander the very busy highway, and step onto the green grass. We’d visited Rev. Kirkland’s and Skenandoah’s gravesite are Hamilton College; you can see photos and my post about it here. 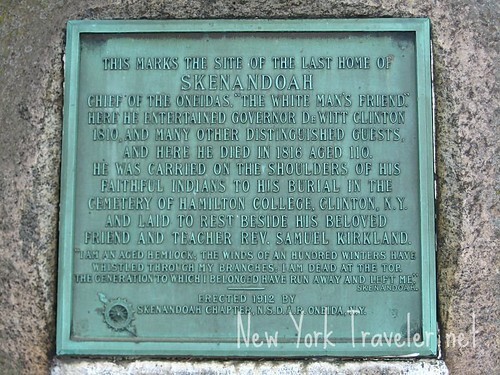 We know about the great Oneida Chief Skenandoah– that close friend of Samuel Kirkland (founder of Hamilton College). Under Kirkland, Skenandoah became a Christian who influenced his tribesmen to join the Americans in the Revolutionary War. His history– and the history of that stone– and his history in relation to that stone– is absorbing. This page taken from The History of Chenango and Madison Counties, 1880, by James H. Smith tells of the little-known history of the Oneidas and the first white settlers to the region. Thus they were known as the people of the stone set in the fork of a tree. Tradition ascribes their origin to a stone, which, says Schoolcraft, “is a large, but not enormous, boulder of syenite, of the erratic block group, and consequently geologically foreign to the location,” there being “no rocks like this till we reach the Adirondacks.” “This stone,” says the same author, “became the national altar,” and “when it was necessary to light their pipes and assemble to discuss national matters, they had only to ascend the hill through its richly wooded groves to its extreme summit,” an eminence in the town of Stockbridge, where, he says, this stone, and the first castle of the Oneidas was located. And who is “Schoolcraft”? I could find no reference to him on the website. Is this a reference to a relation of James Schoolcraft Sherman of Utica, vice-president during the Taft administration? 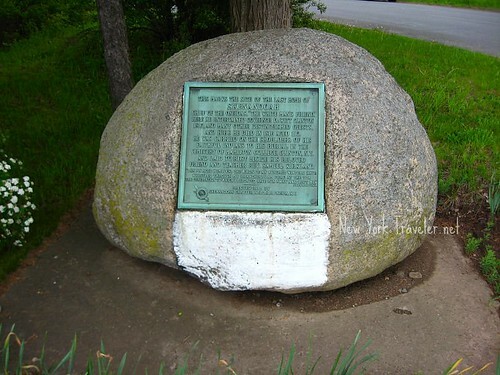 Another source at anglicanhistory.org says that this largest boulder of syenite rested at Forest Hill Cemeteryin Utica, New York. Does it remain there, somewhere? Or was this stone removed to the four corners at Route 5, that same stone in the photo above? (Incidentally, Forest Hill in Utica is where James Schoolcraft Sherman is buried). Before the door of an old chief, resting upright on the ground, stood the palladium of the clan, a stone of some size, declared by Mr. Kirkland to have been an object of idolatrous worship to many of the people. It was “a cylindrical stone of more than two hundred pounds weight, and unlike any other stone in that region.” From the earliest records, the Oneidas were spoken of as the “People of the Stone.” Onia is their word for a stone, and Oniota-aug means the people of the stone. The French called them Oneséionts; with the Dutch and English they were Oneidas. Tradition declared that wherever the tribe moved, this cylindrical stone of mystery followed them. A strong man could carry it forty or fifty rods without resting; in this way, as the missionary says, it may certainly have followed them in their wanderings. It would seem to have been an essential of this ancient stone of the Oneidas that it could be lifted by the sinews of their warriors into “the crotch of a tree.” and when placed in that position, it rendered their braves invincible. Such is the tradition given by Mr. Kirkland, who was thoroughly familiar with the language and habits of the Oneidas. There was another stone of much greater size, in the Oneida country, about which mysterious traditions hover. It was of considerable size and weight, and lay on the summits of a commanding height, overlooking the country on the Oneida Creek, as far as the lake, which on a bright day can be seen in the distance. At one period the principal Oneida village lay near a fine spring in a valley beneath the height. There are vague rumors connected with this boulder of syenite, shadows of the uncertain past, which claim for it the dignity of a tribal altar. Of this larger stone Mr. Kirkland makes no mention. It was removed in 1850, from the height on which it lay, to Forest Hill Cemetery in Utica. It is said that there is no stone of the same geological character nearer than the Adirondack Mountains. 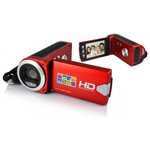 Its weight has been variously stated at from one to three tons. We’ve been to the Munnsville Museum in the Stockbridge/Munnsville area. I was researching genealogy information on my ancestor Nathan Edson (a survivor of the Battle of Lexington) and learned that he had been granted the area of Stockbridge for his war services. The Indians of that area had moved to Oneida Castle, NY, in 1784. I am surprised and mystified about all the historical connections, and now there is a personal connection. If I ever had to explain why history is such a fascinating subject, then this is why! Wow, that is fascinating!! I love history and I love learning things I never knew. It’s truly amazing how things really are all interconnected. In forest hill there is a pedistal with a plaque about the stone. But obviously it has been moved. Just this last week I made my boyfriend pull over the car so I could read about the stone. I was excited to find it after a nice trip to the Oneida Community Mansion house. Wow, really?!?! I am going to have to rummage around Forest Hill! That is amazing! I wonder where the stone went? Wow, thanks for that tip about the book!!! Excellent! It is at my library and I’ve got it reserved. 😀 Thanks! The so-called “Sacred Stone of the Oneidas” used to rest in Forest Hill Cemetery . . . I remember taking an out-of-town visitor to see it in the late 1960s. I thought I read during the 80s or early 90s that the Oneida Nation laid claim to it and removed it, but the Forest Hill Cemetery Website and a page on the NYSED website seem to suggest that it is still there. Maybe someone could check it out? I’ve been reading a book about the history of the Oneidas– and I intend to post more about it in detail. I have discovered that the Oneida Stone was returned to the Nation in 1992 or 93. The history of the Stone and of the Nation is amazing. I’ll be updating with photos soon. 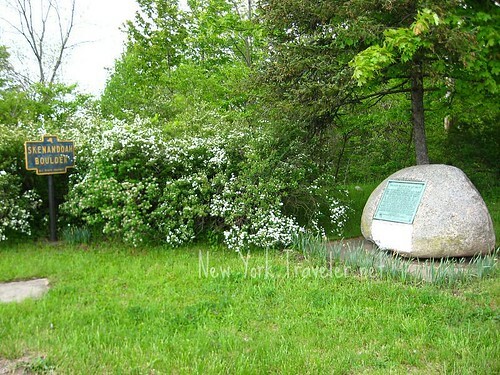 I saw mention of the Oneida Stone in a book I was reading. I did a web search and found your blog. Very interesting. The shape of the stone in Schoolcraft’s drawing is similar to that of other Manitou stones. I am wondering what more you have found? One feels great sadness for the Indian, they have taken or tried to have taken everything from them. I live on the road behind the Shenandoah (Skenandoah)boulder, down over the hill behind it. I often wonder if the actual home was at the highest point in the immediate area where there is now a red brick two story home. From there one can see a wonderful view of the West and North over the city of Oneida, perhaps more appropriate for the greatest chief the Oneidas had. I have never tried to research my speculation. Howdy, Neighbor. Thanks for your comment. Yes, I know that brick house. It’s an Italianate, so it was probably built between 1870 and 1890. It’s beautiful and it does command a great view of the valley! I suppose the stone would have been placed at the main thoroughfare, even if Shenandoah’s house was up that hill, just because it would be more visible. Living nearby on Oneida Street in 1974, I found that the Sacred Stone of the Oneida Nation was in Forest Hill cemetary. To me, it was a tragic symbol of what white men did to ravish the Oneida culture. What were we thinking? If a very special stone that doesn’t belong to us looks like a gravestone- we should take it and then put it with other gravestones? I called a close friend who was married to a Cherokee Indian who was active in the American Indian Movement (William Myer) who contacted the Oneida Nation leaders- and the stone was returned to it’s home shortly afterward. I understand that today, whites are not allowed to even view the stone. The Shenandoah boulder is just a historical marker. It is not the Sacred Stone of the Oneidas which was removed to Oneida territory. Schoolcraft published some erroneous material. The stone is not all that large. The lithograph in Schoolcraft’s book bears no resemblance to the stone, but it merely an artist’s interpretation of what the stone might look like. Also, regarding one of the comments that “we” whoever that might be, placed the stone in the cemetery, apparently it was placed there by the Oneidas for safekeeping as they did not wish it to be on private property which could be sold at the time, however the marker was placed there by the cemetery and also contained some unfactual material which I presume is the reason the Oneidas did not take the base or marker. The cemetery offered it to them. I see Tony Wonderley’s book is recommended in the comments and it should be good. Dr. Wonderley served as the Oneida Nation Historian for many years. You may also read about the stone and see a photo of it in my book, Central New York and The Finger Lakes: Myths, Legends, and Lore published by The History Press. 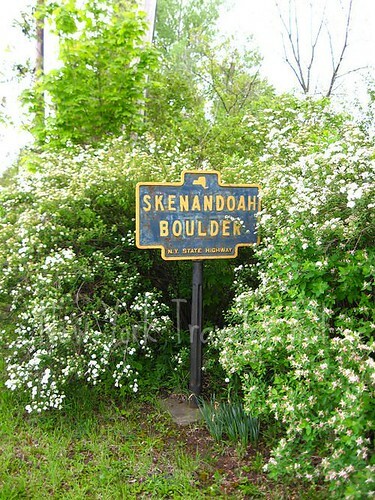 I was pleased to find your piece drawing attention to the “Skenandoah Boulder.” While you are entirely correct that Kirkland and Skenanadoah are both buried at Hamilton College, your piece makes it sound as if that Skenandoah was carried on the shoulders of his fellow Indians up College Hill at his death in 1816. This was not the case; at the time Kirkland was buried behind his house, a property now known as the Harding Farm, on Rt. 233. Skenandoah was first interred there, and the two were moved, I believe sometime in the 1840s, to the College cemetery. I offer this in no critical spirit; it is nice to see someone interested in the topic! This is a fascinating subject. You asked who Schoolcraft was. Possibly after all this time you’ve subsequently learned the answer: he was Henry Rowe Schoocraft, a geologist and Indian agent who worked with and studied Native Americans during the 19th century. future generations. Where I grew up in the Berkshires there is a hudge stone called Balance Rock. Thru the years its faced has been carved, with names, numbers and all sorts of inscreptions some hardly readable. I have a “feeling” that this Boulder was significiant in the life of the Native Peoples that lived there before us. It is kind of spiritual.